The search for a man who escaped in handcuffs Saturday from the custody of a San Diego Harbor Police officer has ended. The suspect, whose name has not been released, was captured downtown around 11 a.m. Sunday following a dramatic foot chase through the city by San Diego police. The man was originally arrested Saturday by harbor police on suspicion of vandalizing a restroom inside a Marriott Hotel, but he escaped in handcuffs and a manhunt ensued. Sunday the suspect was spotted shoplifting inside a Ralphs grocery near 1st Avenue and G Street, according to SDPD Lt. Christian Sharp. When officers arrived, the man took off on foot into Horton Plaza, hopped a trolley, but bailed at a station near Kettner Boulevard, Sharp said. A police dog was “deployed,” and officers were able to detain the suspect, Sharp continued. 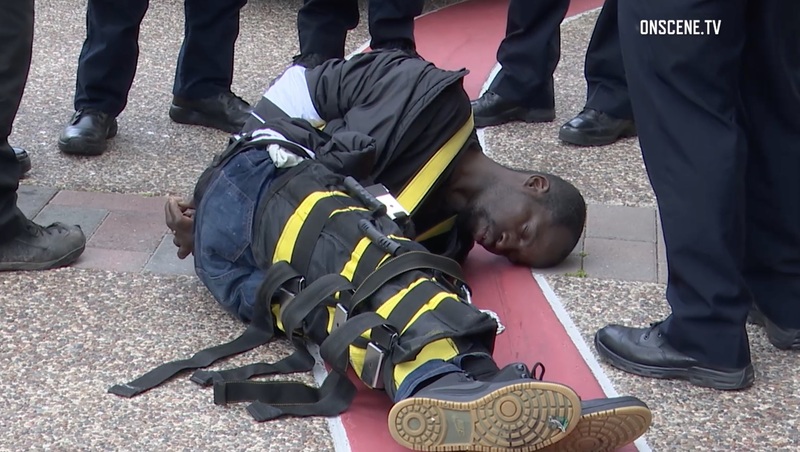 Restraints were used to immobilize the man, who allegedly continued to resist arrest. He was transported to a nearby hospital for treatment of a K-9 bite and was scheduled to be booked on multiple felonies, Sharp said.